We are preparing now for our annual Winter Boot Party, 8 a.m. to noon Saturday, Dec. 8 at Christ Church Cathedral. Many thanks to The North Central Region of The Episcopal Church in CT and Christ Church Cathedral for hosting our party. To volunteer for our life-changing event, email us at abby@footwearwithcare.org. We welcome volunteers 17 years of age and older. Special thanks to our good friends at the Combat Veterans Motorcycle Association of CT. They just gave us a $1,000 grant to kick off our winter campaign. They say, “Vets help vets.” And they do. When the combat veterans learned that Officer Jimmy Barrett, a fellow combat vet, could use a little help at Footwear with Care, they stepped up immediately! We also now help about 30 homeless veterans–a small fraction of Hartford’s homeless community. 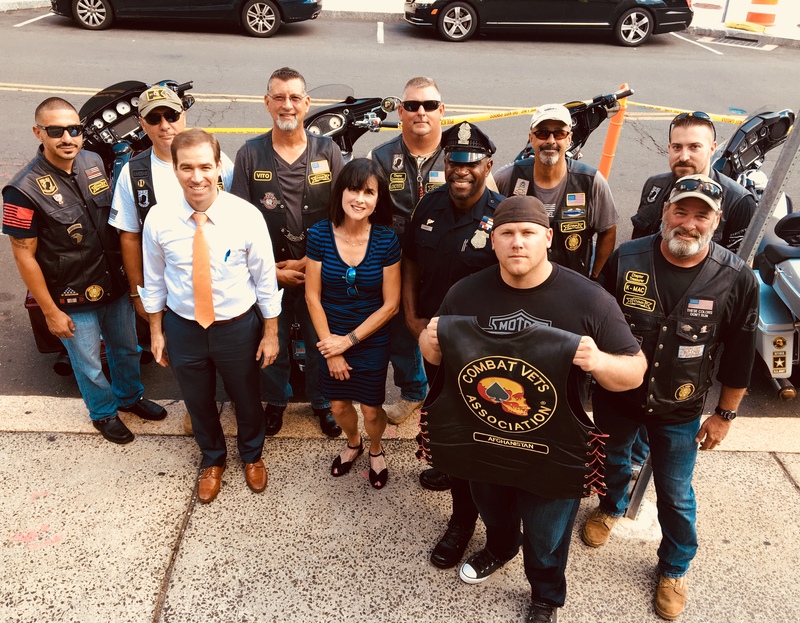 We were lucky to have Mayor Luke Bronin–also a veteran–stop by to meet his fellow vets.